A QML document defines a hierarchy of objects with a highly-readable, structured layout. Every QML document consists of two parts: an imports section and an object declaration section. The types and functionality most common to user interfaces are provided in the QtQuick import. The types and functionality that Qt Quick provides can now be used in the QML document! The object declaration in a QML document defines what will be displayed in the visual scene. Qt Quick provides the basic building blocks for all user interfaces, such as the objects for displaying images and text and for handling user input. This defines an object hierarchy with a root Rectangle object which has a child Text object. 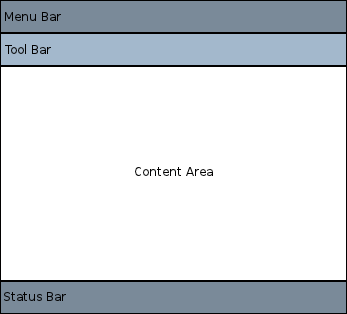 The parent of the Text object is automatically set to the Rectangle, and similarly, the Text object is added to the children property of the Rectangle object, by QML. If we save that document as "HelloWorld.qml", we can load and display it. To display the graphical scene defined by the QML document, it may be loaded with Qt Creator. For simple UI files such as this one, select File > New File or Project > Applications > Qt Quick UI from within Qt Creator. Pressing the green Run button runs the application. You should see the text Hello, World! in the center of a red rectangle. While Qt Quick provides basic graphical elements, Qt Quick Controls provides ready-made QML types for use within an application. The application has two menu items and a button in the middle. Clicking on the Exit menu item closes the application. There are also different navigation methods and different controls such as buttons and sliders available. The following examples are available from Qt Creator and demonstrate different controls and layouts. Feel free to copy and paste the snippets onto this simple Hellow World application to see how QML works. This example can be saved as "ClickableHelloWorld.qml" and run with qmlscene. Whenever the user clicks anywhere in the window, the rectangle will change from red to blue. Note that the MouseArea type also emits the clicked signal for touch events, so this code will also work on a mobile device. By accepting focus, the color can be changed to blue whenever the return key is pressed. Objects and their properties form the basis of a graphical interface defined in a QML document. The QML language allows properties to be bound to each other in various ways, enabling highly dynamic user interfaces. In the following example, the geometry of each child Rectangle is bound to that of the parent Rectangle. If the geometry of the parent Rectangle were to change, the geometry of each child Rectangle would automatically update due to the property bindings. The value being displayed will vary from 0 to 150 periodically. One of the most important concepts in QML is that of type re-use. An application will probably have multiple visual types which are all similar (for example, multiple push buttons), and QML allows these sort of things to be defined as re-usable, custom types, to minimize code duplication and maximize readability. In this way, modular user interface types are assembled and reused within an application. See QML Object Attributes for more details on how to develop your own reusable components. Now that you have seen QML in action, you are ready to take your next step. The follow page will lead you in your journey with QML.